Are you all excited for Halloween this weekend? Everyone around town has been sporting their costumes today (I guess because it's the last day of school & work for the week) so I'm getting in the Halloween spirit. What are you going to dress up as for Halloween this weekend? Share in the comments below! This week I'm keeping the items limited to Halloween inspired things that I'm loving or lusting after, so here they are! I adore Philosophy products, and these are no exception. Use Sephora's F&F code (FF2010) for 20% off. Hocus Pocus - particularly this song in the middle of the movie. I don't like scary movies, so this is the only Halloween type movie I can watch to get in the festive mood. Alexander McQueen's iconic skull scarf is gorgeous, and adds just the right amount of edge to an outfit. 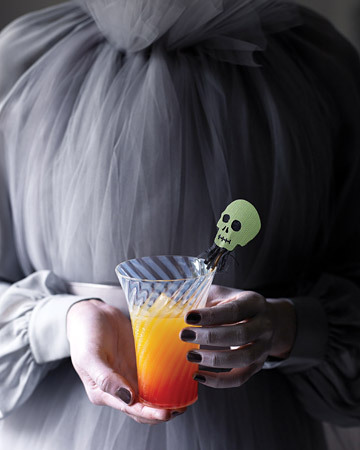 It's been a long week, so I think I might indulge in one of Martha's Halloween inspired cocktails this weekend. Click here to get the recipe (+ a bunch more). That cocktail looks fab!! What are you dressing up as for Halloween? I'm with you on all of these things, especially the cocktail! Budget Babe - I really am going to have to try that cocktail this weekend. It looks so yummy.